So, dealing with Southwest gas today, I got to thinking that I NEEDED to write a post on how I personally deal with getting things done. 1) I’m a very VERY busy women. As stated in other posts, I wear many hats, that keep me busy most if not all of the time. I’m a wife, home maker, mommy, student, teacher, and career business women. I simply don’t have the time, nor the patience to deal with companies that lag at doing their job. 2) I have schedules to keep, time frames to stay on top of, and I keep them all juggled fairly well, and I don’t need an unnecessary kink in the system. 3) No one, and I do mean NO ONE messes with a hugely pregnant women who has two little ones; a toddler and pre-schooler. When my bills are paid, I expect my things to work, and not just work, but work properly. You better believe I will be proactive and persistent in fixing the issues. So, how do I deal with these companies when there is an issue? Especially since I am very proactive about things, I keep things well oiled and maintained, and I have a system to make sure all of the bills are taken care of; in essence my bills are always paid. 1) When I call, if I’m doing something other than the basic changes, or bill payment, I almost always just give them the info they ask for, tell them VERY briefly my issue, and then request a supervisor immediately. What I’ve learned is that, no matter HOW much or HOW little information you give them, the first person you speak to, can never do anything to fix your issues if it’s outside of the basic things as mentioned previously. MOST times the second “supervisor” (which I know from working in call centers, is not always a supervisor, they are floor leads) can fix the issues, on the very rare occasion, they can not. You sort of have to know what your issue is, and kind of know how the companies work, in order to get to the right person. Minor issues above the basic changes and bill pay, these floor leads can correct. Major issues, you will just have to briefly explain the issue again, and ask for a higher supervisor. That third person (third time is the charm, right?) can almost ALWAYS fix what ever issues you are having. 2) My example currently would be with my gas company. My bill is paid, and the heater was not working. I called yesterday and after a two hour ordeal, they finally sent some whack tech out, who either didn’t care, wouldn’t do anything, or was just lazy. He didn’t fix the issue. By the time I got to call back, they said they couldn’t send anyone back out until Friday. (Mind you they charged me $15 to send a tech out to fix the issue, that wasn’t fixed.) Well, I was completely upset by that time, and had other issues I needed to face at that moment, so I said I’d be calling back. Which I did; today. When I called back I finally got to that third person, the real “Supervisor” and got an expedited “medical” reason to get a tech out today, right now. 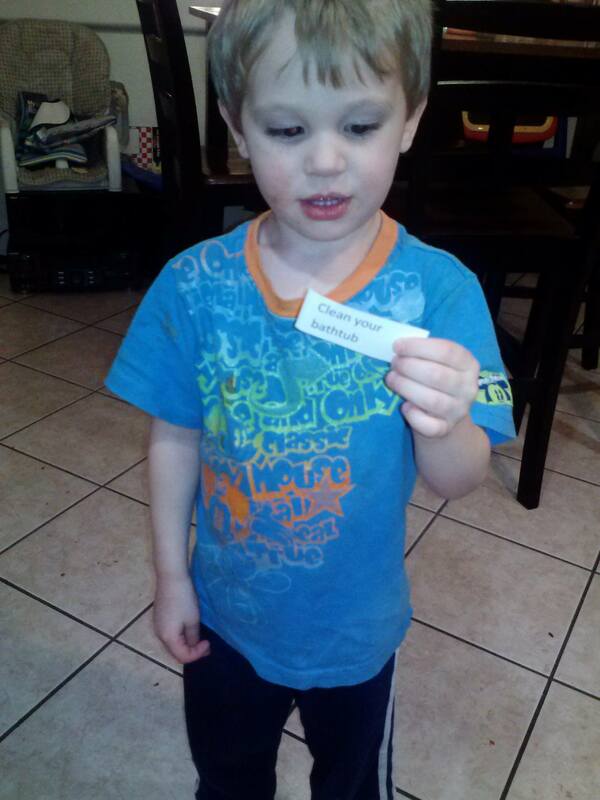 I’m hugely pregnant, and my two little ones are sick; I made sure to say they were a pre-schooler and toddler. I even made sure to tell them that both of my little ones were sick. Yes, believe it or not, the age of children and their condition, will light a fire under these companies behinds. Especially when you explain that you can’t even make them feel better because you have a gas water heater, not electric. So that’s my second tip really, TELL THEM YOUR CHILDREN’S AGES and IF THEY ARE SICK! This is a case when “over share” will get done what you need done. She TRIED to charge me another $15. When I CALMLY explained to her that I was already charged yesterday for this, that it was not fair to charge me again, seeing as the guy didn’t fix the issue, nor did he enter my house, or was willing to do so to check on the issue, she promptly waived that fee. The one fee, okay, I mind that less, but you wont be charging me twice for the same issue, when it wasn’t taken care of the first time. The gas guy got out here finally, and very promptly I might add, and it was a broken switch, the pilot switch to be exact. Yes, they do break, even on their own, (I’m not a gas professional, I don’t know how they work, that’s not my job. I just know how to maintain my stuff, and when they are working/not working.) In either case, he fixed it in less than 20 mins, and got on his way. My heater was working again, and I had hot water finally. 3) BE CALM! You get more bee’s with honey than you do with vinegar. Being rude, mean, nasty, and just down right applauding, wont get you anywhere, nor get anything you need done. I have learned to be calm, and low key, truthful, and direct. This seems to get the best responses. Don’t LIE to them, and don’t over exaggerate, don’t be “chipper” either; just be calm, and pleasant. I used to get so over aggregated, and you could hear the panic almost in my voice, and it never got things done, then one day I just decided to start directing them with a calm and pleasant approach, and this greatly improved getting things done for me. 4) BE FIRM! You can be firm while being calm and pleasant, you don’t have to be firm and rude. I’ve only had to call and make payment arrangements on bills a few times, and the times I have had to do that, they have always wanted me to pay what I knew I couldn’t, or on a day I knew would not happen. For example, I had to call my cell phone company once, and my bill was like $100 bucks, I totally just forgot to pay it, not a big deal, it happens sometimes, and luckily for me I’ve been a customer with them since 2008. However, they always start off with saying you have to pay x amount, then you simple state, “I’m sorry I can really only pay this amount or on this day. I have to have money for gas to get to work/school, and food. Will this amount work?” KNOW ahead of time exactly WHEN you can pay and HOW much you can pay, and stick to it. They will always haggle it down two more times before they will ultimately accept your offer. Just be nice, and keep it calm, but be firm; in the sense of standing by your offer. These companies want your money and will take it any way they can, even if it means waiting a little longer for it. Like I said, I don’t need to do that often, very rare occasions I do need to do that, because hey, I’m human, I slip sometimes and forget. 5) BE PERSISTENT! Don’t take “no” from the first person you speak to as the final solution. Refer to tip number one, remember that most times, the first person you speak to, can’t do what you need them to do. Often times it’s the second or third “supervisor” you speak to that will get it taken care of. 6) TAKE CHARGE! Yes, take charge, you pay them every month, and you expect your services to work properly. Take charge, don’t let them have the power just because they are the bill company, YOU PAY THEM! Sometimes a gentle and subtle reminder that YOU PAY them, not the other way around will help move things along. I always like to throw in “yes my bill was paid on x day, my new bill just came out/will come out on x day and I already have bill pay set up to pay on x day.” That shows them you are on top of it. Sometimes I throw in a little extra like, “I’m paying you for my gas so I can have heat during the winter and hot water, I can’t give my sick children a hot bath because the gas is not working. My bill is paid, so I really need my services to be working properly. After all it is why I pay you every month and on time.” ON an even rarer occasion I have had to get a little more “rougher”. I do have a background and connections with local media, and will say, okay, I guess I’ll have to call so and so with so and so news and tell them that you are leaving a third trimester pregnant women and her sick toddler and pre-schooler without gas for heat and hot water when our bill is paid for almost a week.” THEY Do not want that bad PR. Trust me they don’t. Although I have that connection, I suspect MOST of you know how to contact the news stations to submit stories, emergency stories, and things like “3 on your side” etc. If push comes to shove, don’t be afraid to throw that out. Be TACTFUL, calm, and firm about it. There is NO need to be rude or nasty about it. 7) BE PROACTIVE! Don’t just wait for them to do their job, constantly call them to keep them doing their job. Ask for an ETA (Estimated time of arrival) ask for the tech’s name, ask where you stand on their daily work orders. Gather as MUCH information as you can, and be sure to write this down, along with anyone’s names you have spoken to. Make sure to include dates and times you called. (If you have a cell you can always re check your call history, but just write it down for good measure.) You will NOT believe how many times I’ve called to deal with issues, and the rep did not appropriately or accurately note the account. THEY CAN pull call logs, provided you have the correct date, time, person you spoke to, and the number you called from. They CAN and WILL pull that call and listen to it. This works to your benefit!!! Trust me! 8) PLEASE & THANK YOU, go a LONG way! Sad to say that I have to actually say this, but I have seen MANY MANY people not use this! I just can’t believe how many people will not say Please and Thank you. Trust me, it will take you further and get more done if you use please and thank you. 9) ANSWER their questions genuinely. If they ask you how your day is going, or what the weather is like, then answer them with a truthful reply and genuine reply. They are just simply trying to pleasant and cut the dead air while they work their magic. It makes them feel more comfortable with you, and sympathetic to you, and will thus further get you where you want to be. 10) BE PREPARED! SOMETIMES, no matter how much you followed these tips, you will very occasionally get a road block. Sometimes you may need to be prepared to pay a bit more, or pay on a day you don’t want to, or wait until a later time to get a tech out to fix your issues. SOMETIMES, so if you have followed every tip, and you are still getting a road block, still be prepared to offer a tad more, different date, or later time. It’s called compromise. You want them to compromise with you, so be willing to give a tad bit at the end. I hope this helps! Bottom line is, make sure your bill companies do their job and work for you, especially if you are paying your bills on time! Don’t be afraid to pick up the phone and take the initiative! We have pretty much ran through the gamete with our boys in regards to behavioral consequences and disciplines. Everything ranging from warnings, talks, corner time, timeout time, spanking, removing them from the room, taking things away, etc. 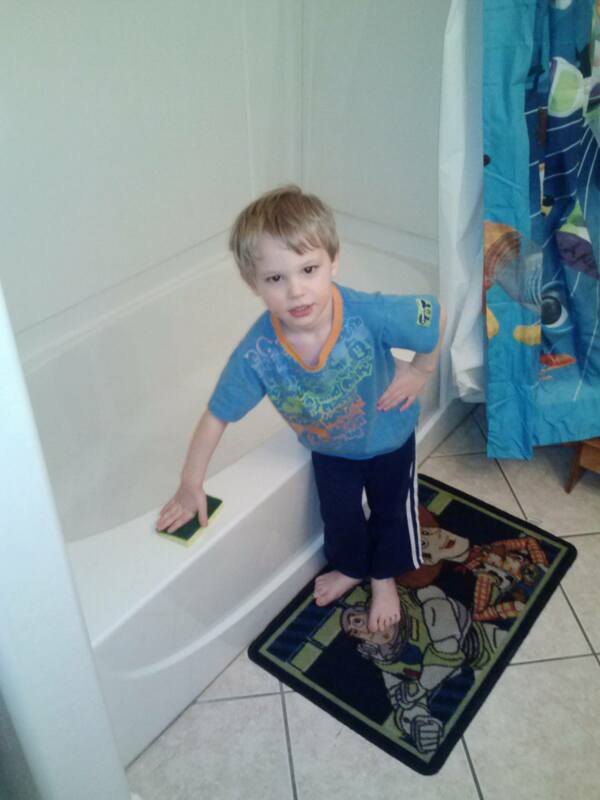 So I spent the last few days SCOURING the internet, namely pintrest for “Creative Consequences” for the boys. I came across the “naughty” and “nice” jars. 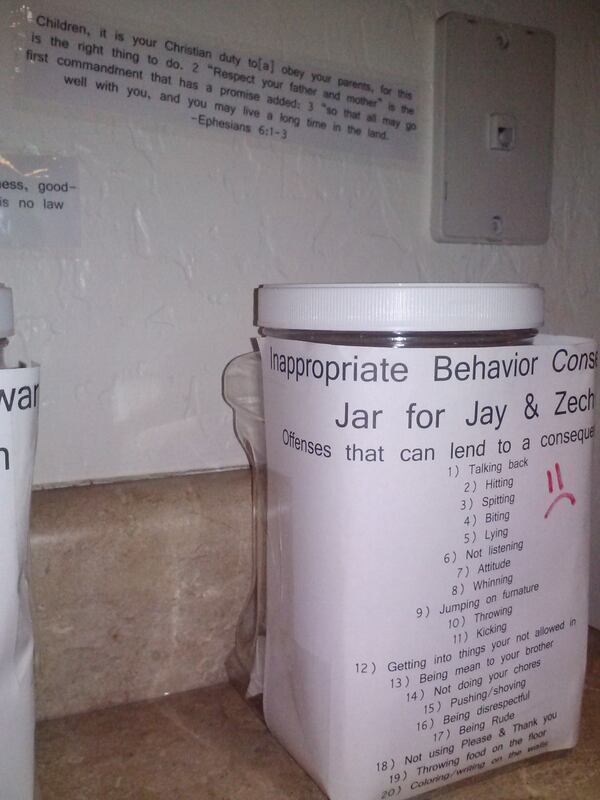 Basically the “naughty” jar, that I have renamed in our house to the “Inappropriate behavior consequence” jar has creative consequences they pull randomly from and fulfill. I have chosen easy monitored tasks and chores they can do. I didn’t go with writing apology letters, giving hugs, etc because they are not old enough at this time to understand that, but they do understand being taken to do a task they may not like nor want to do and kept from playing and having fun. It seems to grab their attention, most especially my oldest. 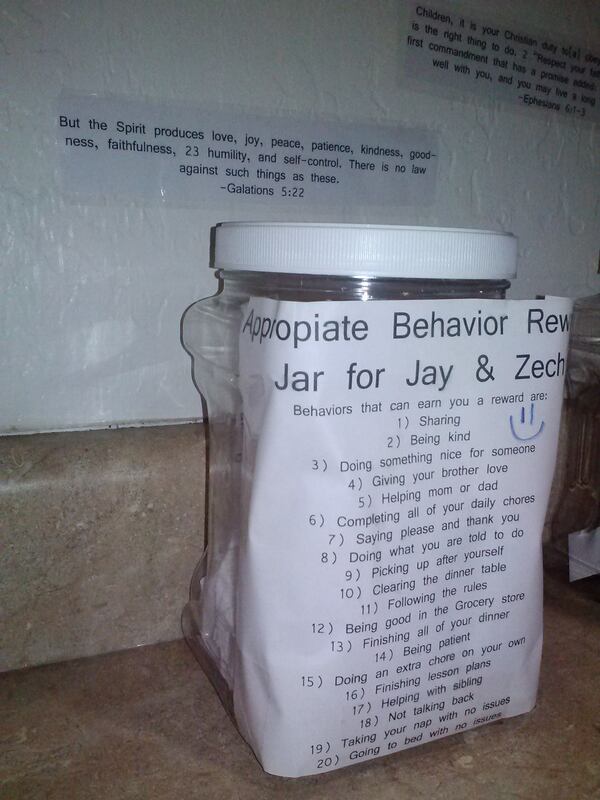 The “nice” jar, that I have renamed in our house to the “Appropriate Behavior rewards” jar has fun rewards they can earn for demonstrating good behavior (based off of the ill behaviors observed lately, so just being nice wont cut it, if they don’t hit when brother steals a toy away, then they can have a reward.) These are extra special things they would not normally get. 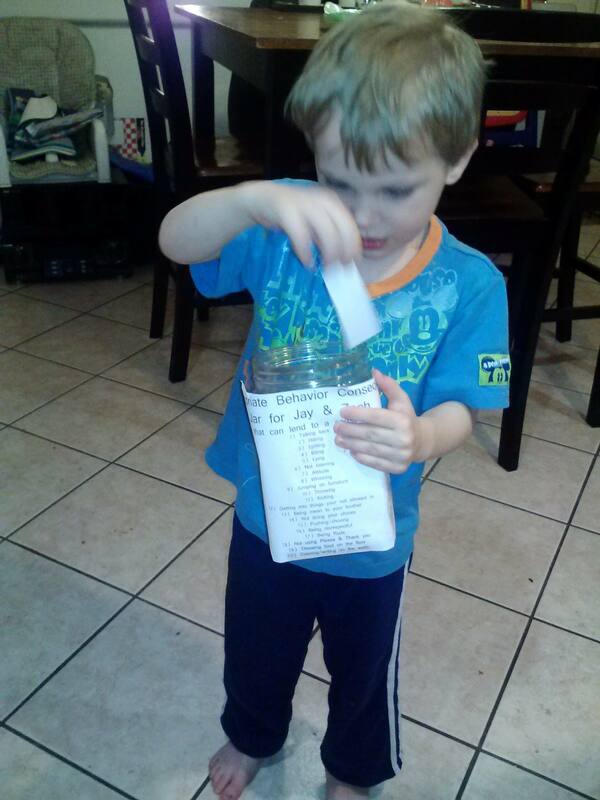 Tonight we had our first contender for the consequence jar. My oldest, Jay, who is 3.5 years old, said he was still hungry and wanted more, I said okay, and looked at his plate. I said, well you will have to eat the last few bites of your green beans before I get you more. He yelled at me, “NO mama, I will not eat that, I want more of this.” Then he decided that he was going to start throwing his green beans. There were three big no no’s here in this one little moment, he told me no, he yelled at me, and he threw something. I should have made him pick three consequences to do, however seeing that this is the “first” offense I only made him chose one, and told him in the future it would be three consequences for each behavior that was inappropriate. 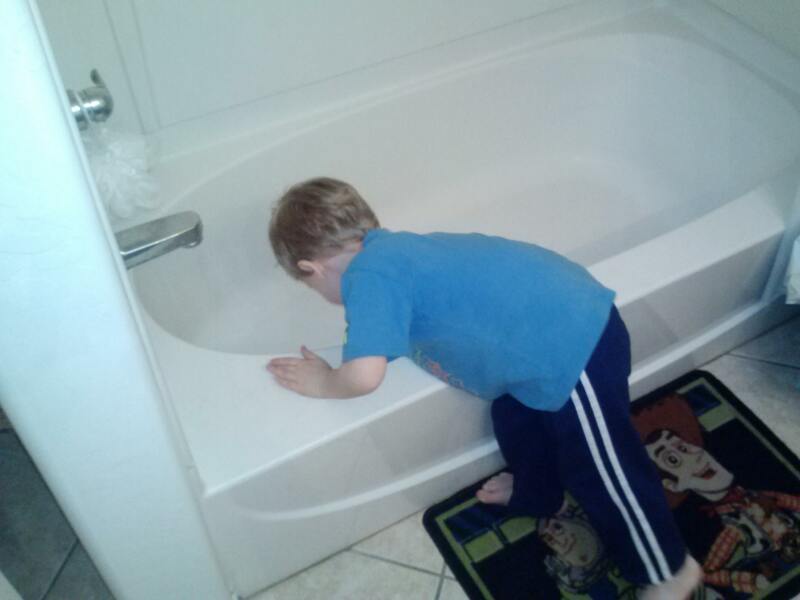 We talked while he carried out his consequence, and we talked some more after as to why he had to chose a consequence and what behaviors lead to getting this consequence. That it wasn’t to punish him, it was to take away something he wanted, ie: playing and having fun. That mommy and daddy would be taking free time, play time away for chore time if these behaviors kept up. He did apologize and we left it with a kiss and a hug. He told daddy that he would not be doing that again. I think it got his attention, so, so far it’s a success. Less stress on me, chores will get done that I don’t have to do, just be there to help facilitate and supervise. 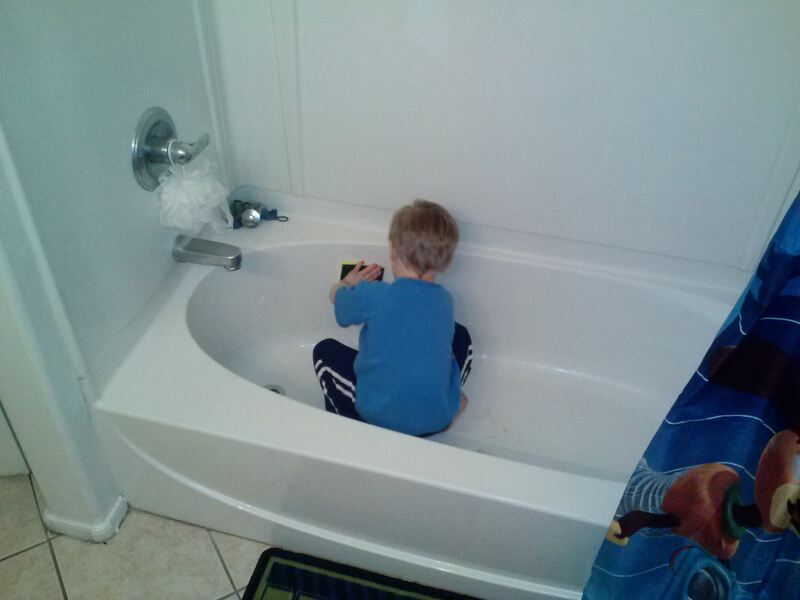 He did a surprisingly good job cleaning his tub tonight. When we got back down stairs I asked him if he was still hungry and wanted to now finish his green beans to have more pineapple, and he said yes. He finished his green beans and got more pineapple. He was a happy camper after that. I’m not ready to call this a complete success as of yet, but it’s a great start, and hopefully it will work with both boys!!! 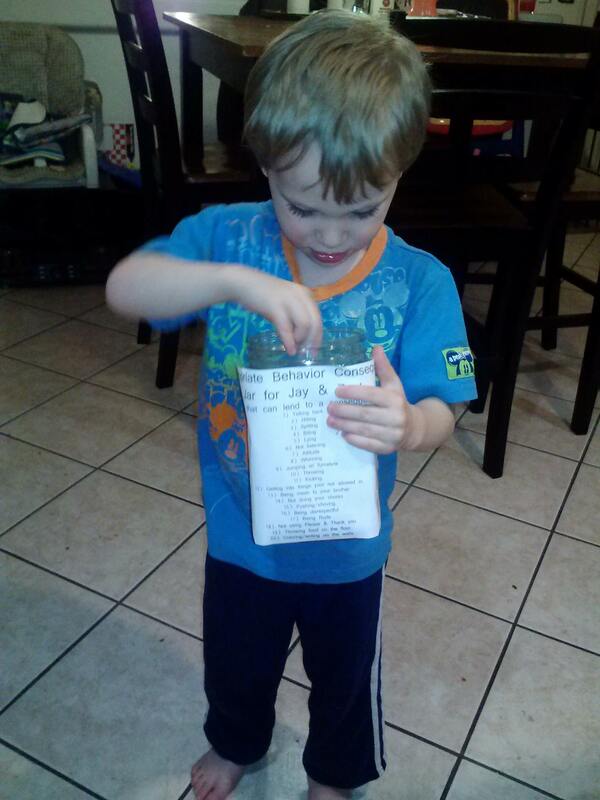 These are “extra” chores above and beyond their daily and weekly chores they must do. Yes my children even at 3.5 years old and 20 months have chores, simple easy ones, like make their beds, clean up their rooms after night time and nap time, clean up their toys before nap and night time, brush their teeth, clear their tables, and put away their dirty laundry. I feel it’s never too young to start. I’m hoping this will help in the future, when they get older and wont have to be told what to do as much. Right now, they pretty much know that when I say lets get ready for bed/nap they start picking up their toys. I don’t have to supervise that as much, just go in the play room and help them pick up the straggler toys. My mom passed away July 7th, 2012. Last Christmas was our first Christmas without her. This is our second Christmas without her, and it’s not any easier, on me. I didn’t know it was affecting my son. He knew nana, went to live in Heaven with God and the Angels. That she couldn’t visit us last Christmas. (That’s the only way we could explain to him last Christmas why she wasn’t there, and why only papa Mike and Aunt Star had come.) He seemed fine with it, and it seemed as if he forgotten everything when papa Mike showed up with the Christmas gifts on Christmas eve. I tried really hard to choke back my tears, and told him that he needed to remember that Nana D isn’t able to come here for Christmas, that she’s up in Heaven with the Angels, great paw paw and Aunt Dawn. But, she would be watching us from heaven and sending us her love. OH, was that a MISTAKE! He started crying, like I ripped the head off of his fave snuggle toy, and yelling at me that I was lying to him. He wouldn’t calm down for anything. Finally I was able to rock him and get him to calm down and he fell asleep in my lap. I can’t stop crying. I’ve done all of the Christmas traditions my mom had always done, I’ve done all of the Christmas crafts I could find, and been so busy preparing for Christmas, this has been my way of sort of dealing with not having my mom here, that I didn’t even seem to notice that my baby was hurting! It didn’t seem like an issue last Christmas!!! I guess I should have seen this coming, we have been talking about all the Christmas things we were doing and how nana would do them with me, and he sees all of her pictures on the walls. He even got the honor of putting her memorial picture Christmas ornament on the tree this year. I thought that if I talked about her, and what we used to do when she was here, that it would be a great way to keep her memory alive for my boys. It so backfired on me, and now I feel like the worlds WORST mom!!!!!!!!!!!! !